Ability Beyond employees celebrate receiving an award at the Fairfield County Business Council’s Healthy Workplace Employee Recognation event in Stamford, Conn., on Tuesday, Feb. 14, 2017. DANBURY — A healthy workplace is a productive workplace. And Cartus is one of several companies taking steps to improve the well-being of its employees. The focus on health and work-life balance earned Cartus an invitation for the second consecutive year to the Business Council of Fairfield County’s Healthy Workplace Employer Recognition event. The council recognized 47 companies throughout Connecticut and New York at a recent breakfast event at the Stamford Marriott. Cartus, a Danbury-based global relocation services company, was one of three local companies honored. 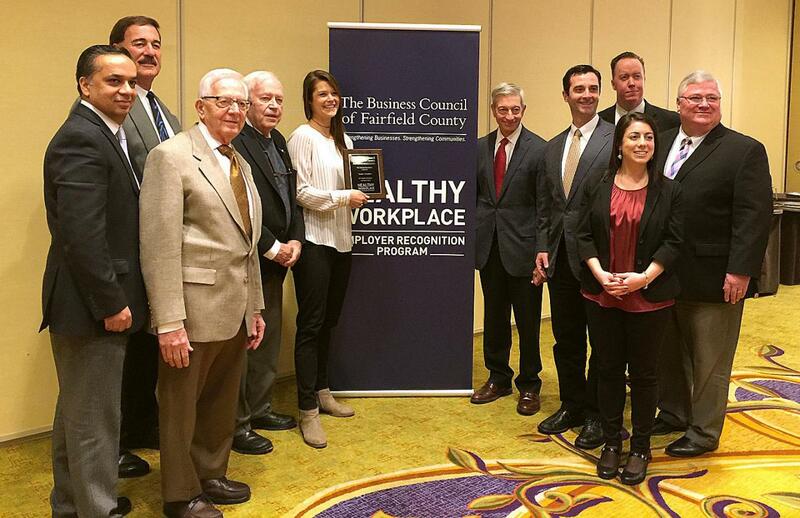 The Healthy Workplace Employer Recognition program is an initiative of The Business Council of Fairfield County’s Wellness Roundtable, which focuses on health and wellness in the workplace. Cartus was chosen for healthy initiatives such as flexible work schedule, on-site fitness center, staffed wellness center, on-site flu and travel immunizations, health-related seminars and support groups, and paid time off for an annual physical. Cartus also addresses the spiritual and mental needs of its employers with an outdoor meditation garden for employees wishing to decompress. Cartus is Danbury’s largest employer with a workforce of about 1,300. Boehringer Ingelheim of Ridgefield and Ability Beyond of Bethel were also recognized. Boehringer Ingelheim, a pharmaceutical company, partnered with Aetna, Premise Health and Quest Diagnostics to provide free and confidential wellness programming to employees. Key components of the program include a health risk assessment, wellness screenings, nutrition, physical activity, weight management and work/life effectiveness programs. BI provides on-site occupational health services, a fitness center, healthy dining options, and indoor/outdoor walking paths. Grade A Market, which owns ShopRite grocery stores in Brookfield and Danbury, received an Innovation Award for new programs designed to improve the health of its employees and customers, such as having an in-store registered dietitian. Cora Ragaini, a retail dietitian for ShopRite, spoke on a panel during the event about her work in the stores, where she provides complimentary services such as one-on-one consultations, supermarket tours, support groups, weight management classes, kids and adult cooking classes and yoga lessons. “It’s important we let people know that the grocery story is more than just a place where you get food. It’s also a place where you can get connected and discover more ways to live a healthy life,” Ragaini said. “It’s a great honor to be singled out for the work that our dietitians are doing,” sad Chip Cingari, a member of the family that owns ShopRite Grade A Markets.